Biscuit cutters with a diameter of 9.5, 7 and 5 cm. One side of each covered in clingfilm. 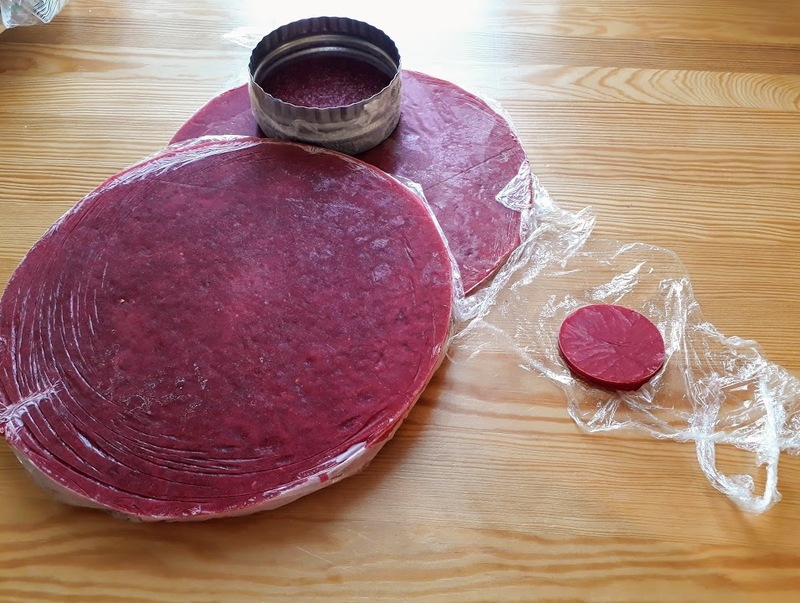 Spring form tin with a diameter of 23cm with the bottom covered in clingfilm – for jelly. Spring form tin with a diameter of 25cm with acetate lining the sides. Make the jelly in 2 batches. Soak the gelatin sheets in cold water. Mush the raspberries and sugar with a blender. Add the water and heat on the hob, but do not boil. Squeeze the water out of the gelatin, add into the raspberries, and mix with the blender again to get rid of any lumps. Sieve into the 23cm tin and also put a little bit into the 5cm cutter. Place into the freezer, and make sure it is fully frozen before removing. Repeat again to make the second batch and fill the 9.5cm mould. Keep in the freezer wrapped in clingfilm until ready to assemble the whole cake. Pour into a 23cm lined tin and cook for 30-40 minutes (may need longer?). Take out of the oven and wrap in clingfilm to cool over night. Then divide into 3 equal level layers. In a separate bowl whisk the cream cheese. Melt the gelatin in the microwave in short bursts, being careful not to overheat. Add this into the cream cheese and whisk again. Then fold in the whipped cream. 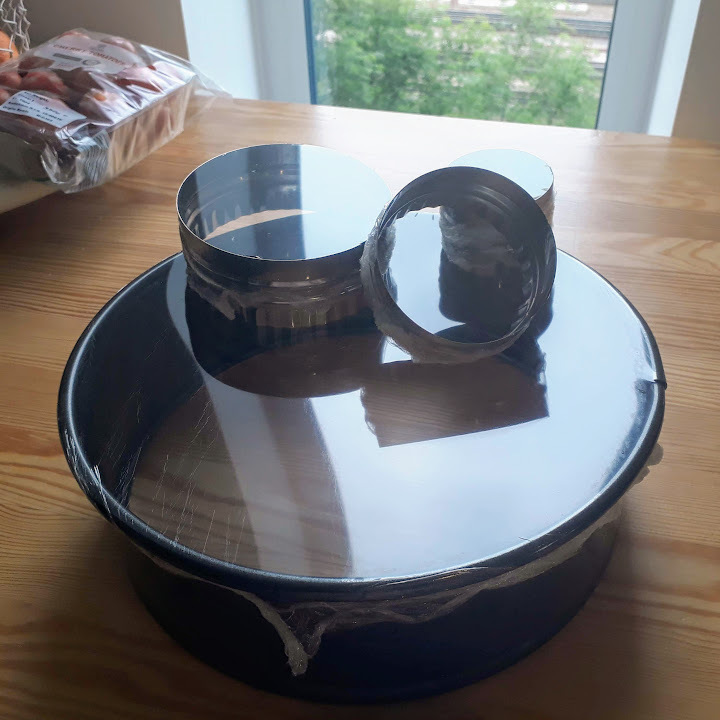 Assemble the cake up side down in the 25cm tin lined with acetate. Put 320g of the mousse into the bottom of the 25cm tin. 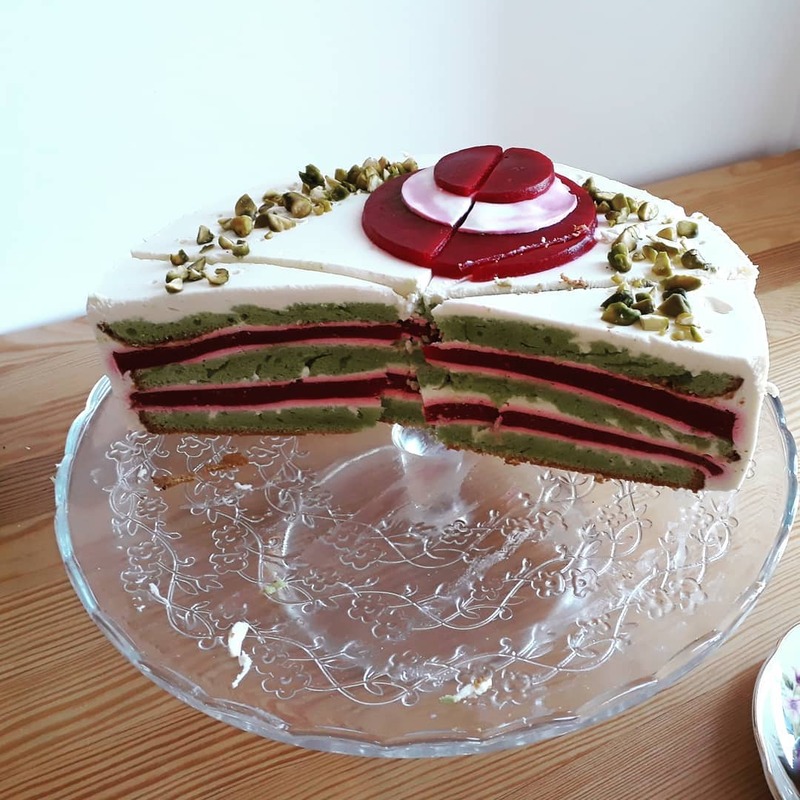 Then put in the layers as follows: top sponge, 160g mousse, jelly, 160g mousse, middle sponge with 115g of pistachio paste spread on to it, 160g mousse, jelly, 160g mousse, bottom sponge. Put into the freezer for a few hours until the mousse is set. Turn out of tin; you may need to use a hairdryer to loosen the bottom. Keep in the fridge. 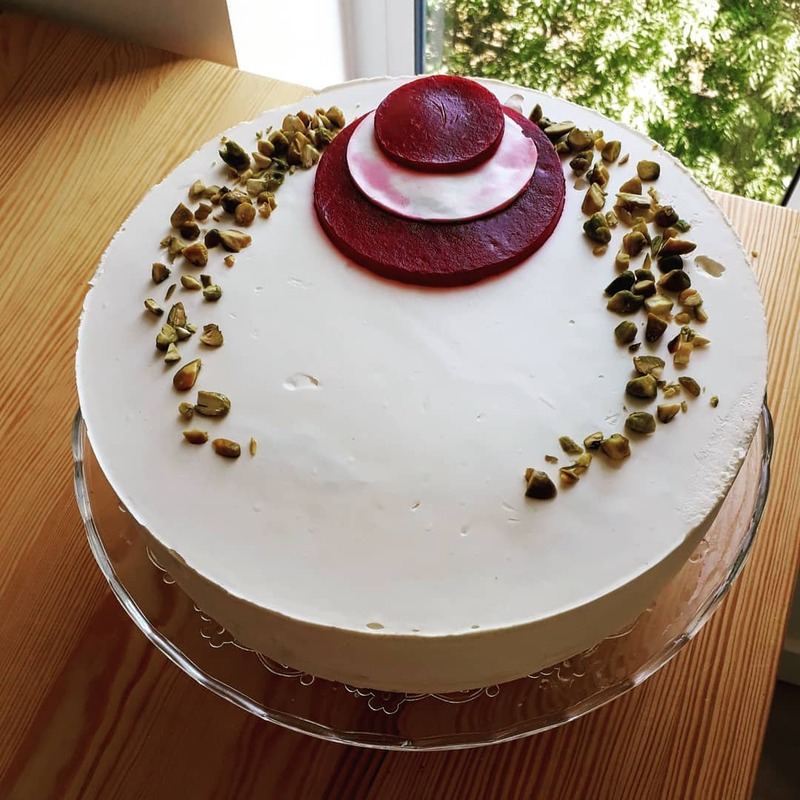 Decorate right before serving by stacking the jelly and mousse from the biscuit cutters, and scattering the chopped pistachios.